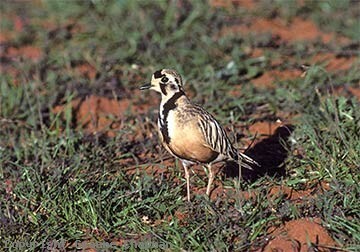 Inland Dotterels are also known as Australian Dotterels and are widespread throughout desert regions of Australia where they inhabit treeless areas such as gibber plains, claypans and shrub steppes - in recent times they have adapted to the broad expanses of the wheat belt in Western Australia where they occur in stubbles and fallow paddocks. There are stories of farmers who when ploughing, steer their enormous machines around nesting birds to form a little refuge in the paddock. 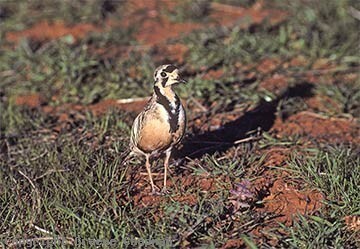 Normally when disturbed they turn to face away from the observer to hide the distinctive vee shaped breast marking and will squat, quail-like, only flying as a last resort. 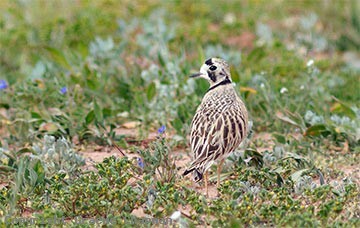 When breeding Inland Dotterels occur in pairs and defend small territories, but outside the breeding season they can be found in small flocks. 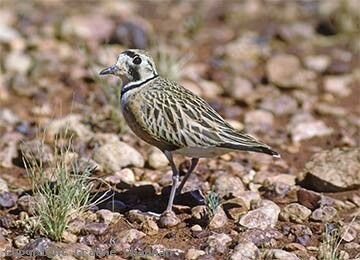 In the arid inland they are nomadic and wander around seeking the good times. 145204 ... Standing back-on, they become quite cryptic.